To book your trip to the Mamanuca islands, simply use our Ferry search box for a one way or return trip. If you prefer to book a day trip or package, take a look at our Mamanuca activities page. The Mamanucas of Fiji are a group of about 20 gorgeous islands that stretch outwards from the west coast of Viti Levu, 7 of which are covered by water at high tide. As is typical of Fiji's many islands, pure white sand beaches, swaying palms and turquoise water greet travellers at every turn. Malolo Lailai is considered to be the centre of tourism within the Mamanuca Islands and is host to 4 luxury resorts, a marina and golf course. Malolo is only 20 kilometers from Nadi and can be easily reached in a 50 minute fast boat ferry trip from Port Denarau or by (sea)plane to Malolo Lailai. If you are visiting Fiji, the Mamanuca islands are a must see destination to spend some time exploring and enjoying. There's plenty to do besides relaxing at the beach and soaking up the tropical sunshine - world class diving, a huge vareity of surface water sports, great places to eat & drink and a few great beach bum nightlife hotspots. Take a look at the summaries below on how to get to Mamanuca and some of the activities on offer. The Mamanucas are all about water sports, ultimate relaxation and snorkeling, windsurfing, sea kayaking and sailing are often offered free to resort guests. You can find out about the best things to do in Mamanuca in our comprehensive travel guide on the islands. The possibilities are endless, so we have selected a number of the most popular islands, ferry routes and activties for you to browse. From the floating luxury of Cloud 9 and resorts of Malolo to the beauty of Mana and Beachcomber Island - you can easily get lost in paradise. Departing from Denarau Marina at 09:00 am and arriving at 09:45 am the trip to Cloud 9 is a quick but beautiful experience. Passing by Malolo Lailai, Malolo Islands and a glimpse of Castaway Island, the boat will take you to Cloud 9 which is a floating platform in the middle of the Fijian ocean. Cloud 9 is located next to the Malolo Barrier Reef giving guests the perfect spot to go snorkeling, enjoy food & drinks and have a great day out completely off the grid. Offering delicious stone oven baked pizza's and loads of other food and drinks, Cloud 9 is definitely worth a visit. Cloud 9 invites travelers to escape to their floating paradise. Cloud 9’s stunning location offers travelers privacy and unforgettable 360- degree views of Fiji’s Islands. Cloud 9 is the one and only floating platform in Fiji. Guests can enjoy a wide selection of international spirits, mouthwatering Italian woodfire pizza’s while sitting back to admire the stunning surroundings of crystal clear ocean as far as the eye can see. The bartenders also serving some delicious fresh cocktails, mocktails and local favorites of Fiji Gold, Fiji Bitter and Fiji Fun. You only need to relax and enjoy the beautiful surroundings. Cloud 9 offers different water sports and activities including flying boarding, motorized surfboard, jet ski or parasailin to create an experience like no other in Fiji. Book your trip with Cloud 9 now! With Aqua Trek Fiji you can discover the underwater world of Fiji. Take a boat through the Mamanuca islands and go on an under water adventure with licensed divers or get your scuba diver license with them. Start a PADI open Water Course with Aqua Trek Fiji and you will soon be certified to discover the underwater world globally. Book your diving trip with Aqua Trek Fiji. There are around 44 dive sites within reach, and the great variety ensures great diving for beginners as well as veterans. The most well-known sites are Gotham City, named after its bat fish, and the Supermarket, which is a popular spot to see reef sharks. For the more experienced diver Vomo Island and Bird Rock are a must see because of their unusual and spectacular coral formations which allow for amazing swim throughs, caves and dramatic sheer wall plunging for about 40 meters with loads of unusual fish life. Malolo Lailai and Plantation Island are home to 2 main resorts, boasting 5 different swimming pools, 4 bars, 5 gourmet restaurants, coffee shops, water activities and much, more! There is just so much to see and to do on this island that its well worth an overnight stay. At 4.00pm daily, the boat departs to return to the mainland, arriving at Port Denarau at 4.50pm. Malolo Cat offers three high-speed catamarans that provide transfers and day trips from Port Denarau to the Malolo Lailai Islands every morning. Visit Malolo Lailai for a day or stay over at one of the resorts and take the Malolo Cat back on a different day. You can find out more about visiting Malolo Lailai Island and the trips offered by visiting Malolo Cat their individual page. With South Sea Cruises you can visits 11 Mamanuca Islands departing from Port Denarau with a crew that will instantly make you feel welcome on board. Take a daytrip, island to island transfer or island hop. South Sea Cruises offers full- and half day cruises to South Sea Island, Mana Island, Castaway Island and a Fiji Island Explorer cruise. 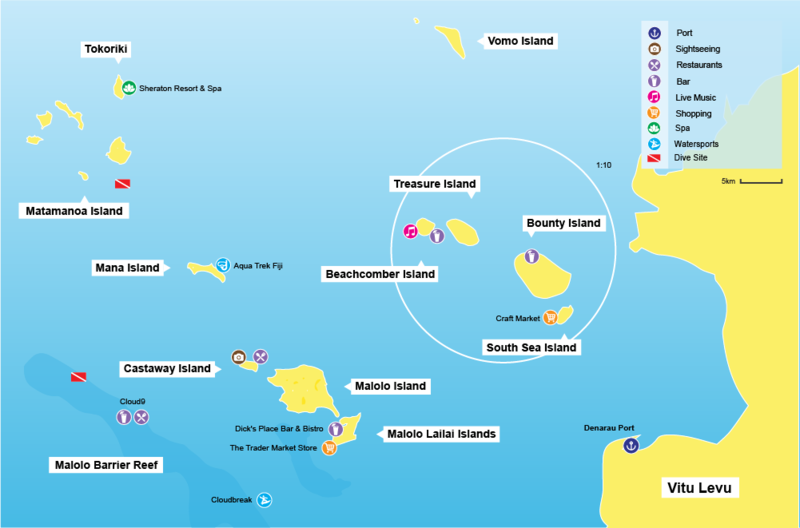 If you are looking for additional options you can include an introduction or certified dive to the day cruise when going to South Sea Island. South Sea Cruises offers 14 transfers to and from the following Mamanuca Islands; Beachcomber Island, Port Denarau, Bounty Island, Castaway Island, Malolo Island, Likuliku Lagoon, Mana Island, Matamanoa Island, Sheraton Tokoriki, Tokoriki Island Resort, Tokoriki Island, Treasure Island and Tropica Island Resort. There is a transfer directly to Nadi Airport from certain islands. For more info on visiting one of the Mamanuca Islands mentioned and the trips offered you can simply visit the page made for South Sea Cruises. Blue Lagoon Cruises offers a beautiful Fijian experience with their 3, 4 or 7 night cruises and island transfers within the Mamanuca Islands. With a minimum of 2 adult passengers you can have the whole boat by yourself or invite friends over to come and join you through the stunning Fijian Islands. The live aboard cruises from Blue Lagoon Cruises will certainly make you understand why the Blue Lagoon is one of the must-see spots in Fiji. Book a 3, 4 or 7 night cruise and explore the Fiji Islands on your own private boat charter. Visiting 12 resorts, Blue Lagoon Cruises can take you to and from the following resorts: Castaway Island Resort, Lomani Island Resort, Likuliku Lagoon Resort, Musket Cove Island Resort, Malolo Island Resort, Mana Island Resort, Matamanoa Island Resort, Plantation Island Resort, Sheraton Tokoriki Resort, Tadrai Island Resort, Tokoriki Island Resort and Tropica Island Resort. You will find more info on private tours or the transfers offered by Blue Lagoon Cruises on their page.